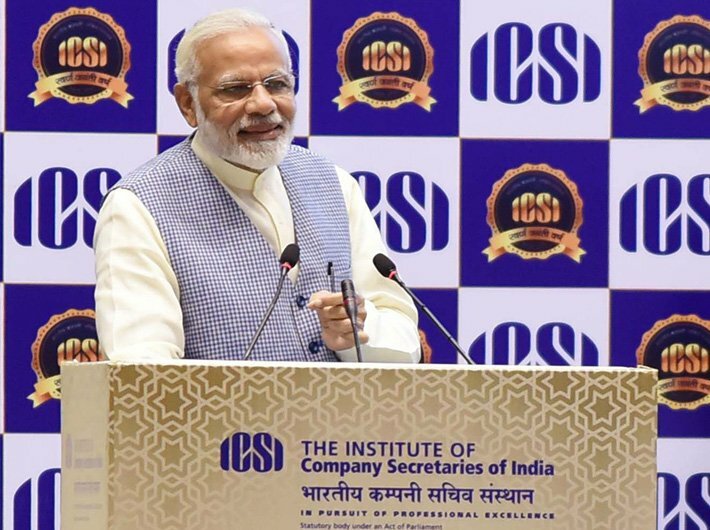 Prime minister Narendra Modi strongly defended the fundamentals of the Indian economy, gave a befitting reply to critics and cautioned against people who spread pessimism in his speech at the inauguration of the Golden Jubilee Year of the Institute of Company Secretaries of India. There are a few people in our country who attempt to weaken the honesty of our social structures, and lower the nation's dignity. The government is working towards cleansing the system of such elements. As a result of the efforts of the government, the economy is functioning with less cash. The cash to GDP ratio has come down to 9 per cent, from 12 per cent before demonetisation. In the past the growth rate had fallen below 5.7 per cent. The low growth rates, on those occasions, had been accompanied by higher inflation, higher Current Account Deficit and higher fiscal deficit. The government is committed to reversing this trend of the decline in growth in the previous quarter. Several important reform related decisions have been taken and this process will continue. The country's financial stability will be maintained. A premium would be placed on honesty, and the interests of the honest would be protected. Businessmen and traders now returning to mainstream may be worried that old records will be checked. We will not allow that to happen. I welcome you now, leave the old things behind and do not be worried. I am with you in the future. People now think fifty times before dealing in black money. There are many Shalyas (a character in Mahabharata) today. They spread pessimism and get a good night’s sleep only after they spread gloom and hopelessness. 87 small and big reforms have been carried out in 21 sectors. Care is being taken to ensure that savings accrue to the poor and the middle class, even as their lives change for the better. Won’t let the present problems jeopardise the future of the country.